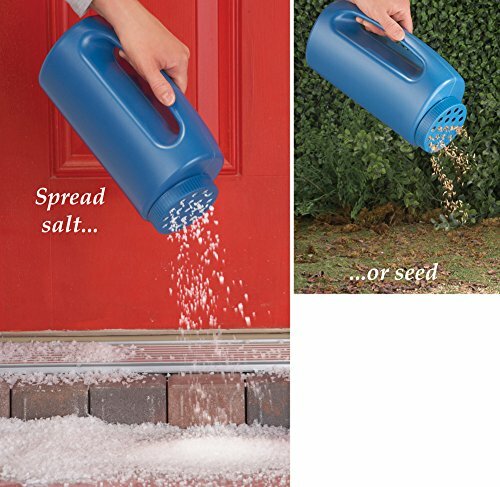 Simply fill this shaker with salt or sand, and sprinkle evenly over your walkways to de-ice and reduce slick surfaces. Also perfect for use in the Spring and Summer to spread seeds and fertilizer in your yard. The spreader has a wide handle for comfortable pouring. Rinses clean. Plastic. Holds 76 oz. 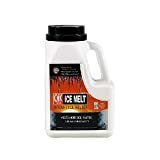 Measures 5-1/2"L x 4"W x 10-1/2"H.
Simply fill this shaker spreader with salt or sand, and sprinkle evenly over your walkways to de-ice and reduce slick surfaces. Also perfect for use in the Spring and Summer to spread seeds and fertilizer in your yard. The spreader has a wide handle for comfortable pouring. Rinses clean. Plastic. Holds 76 oz. Measures 5 1/2"L x 4"W x 10 1/2"H.